Fern is a young girl who speaks out against her father trying to kill the runt of a litter of pigs. Since she makes such a passionate point, Fern’s father lets her keep the pig as a pet. At least for a little while… When it’s time for Fern to sell her pig, whom she named Wilbur, she sends him to her uncle’s farm down the road, so she can still see him. Fern visits the barn often, and becomes friends with the animals, who can talk. 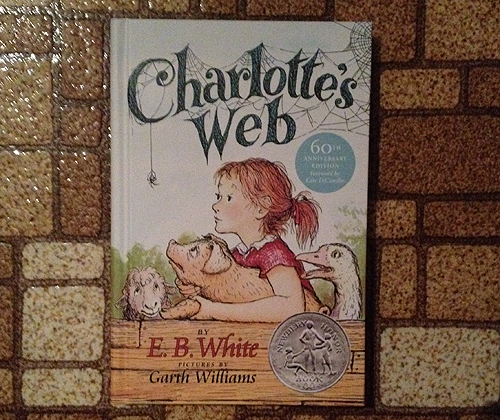 Charlotte, a wise spider, comes out of the woodwork (no pun intended) to save Wilbur’s life when the farmer is thinking of making bacon. I read this book as a kid and loved it, as well as the cartoon movie adaptation. I re-read it over the summer in my book club for adults with disabilities. I remembered the general story, but forgot a lot of the details, as well as the writing style, which I think adds a lot to the story. The book club seemed to enjoy the book as well. This book was banned because “talking animals were seen as an insult to God.” Yes. Really.